Rumors over a lifting of the tariffs sparked a temporary intraday rally for the stock market — not that a number of stocks needed anymore reason to climb on Thursday. Let’s get a look at some must-see stock charts to see what’s in focus for Friday. Boeing (NYSE:BA) got an instant lift on the tariff news, although shares have been trading pretty well as of late anyway. 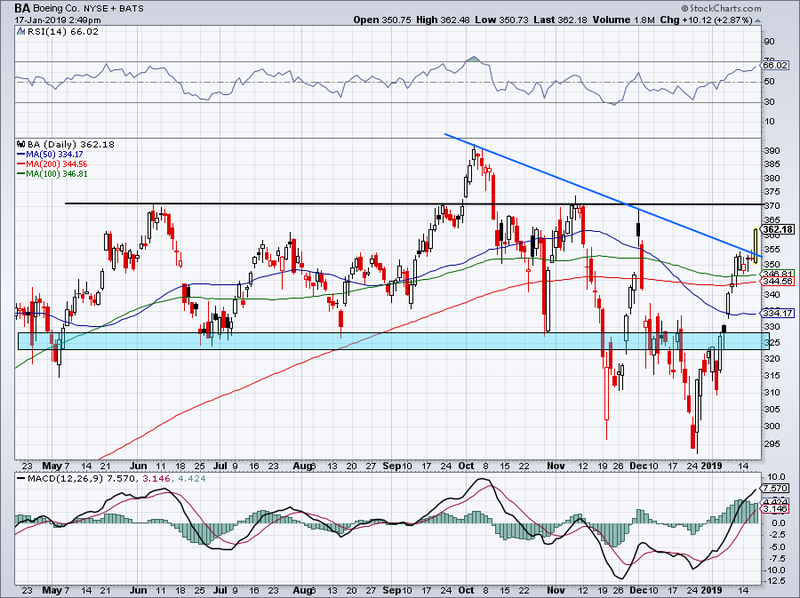 After consolidating near $350 for about a week, shares are powering through downtrend resistance (blue line) on Thursday. The move has been swift and enjoyable for bulls, who are now looking for a rally up to $370. 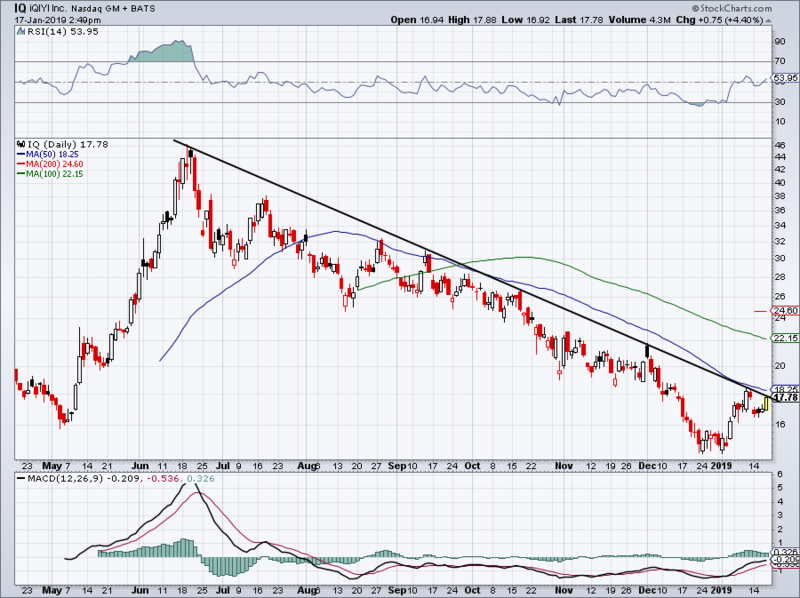 Should BA fizzle before it gets there, it would be encouraging to see it stay north of this prior downtrend line. Over the 100-day and 200-day would also be encouraging. Otherwise, BA may need to reset. Unlike some of the other banks — like Bank of America (NYSE:BAC) and Goldman Sachs (NYSE:GS) — Morgan Stanley’s (NYSE:MS) earnings results weren’t that impressive. However, its reaction isn’t all that bad. While downtrend resistance (blue line) is still firmly in control of MS, the 50-day moving average is holding up. 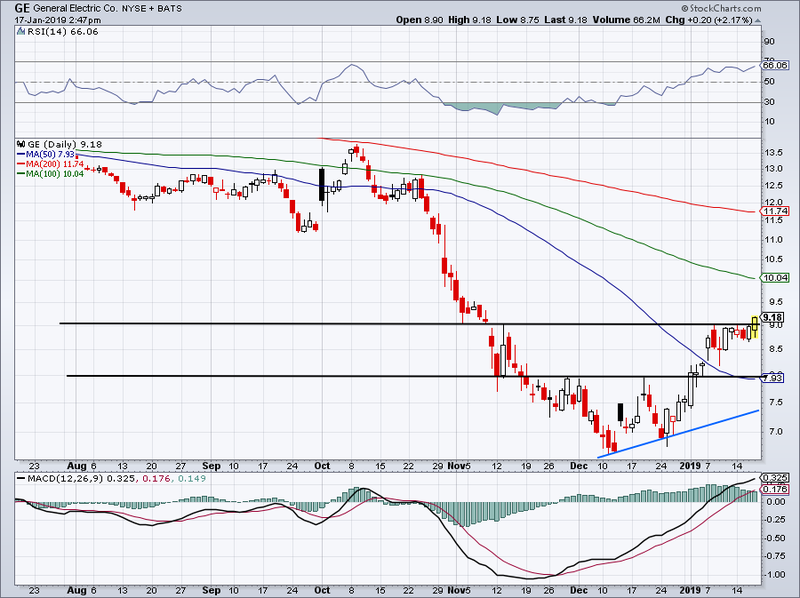 A close over $43.10 would be another bullish development for the stock. Over the 50-day and longs can stick with MS, however, other bank stocks look more attractive at this point. IQ stock has been trading better, but with Netflix reporting earnings after the bell, it will likely be a large driver for IQ in the short term. Currently, the stock is resting just below tough downtrend resistance and the 50-day moving average. 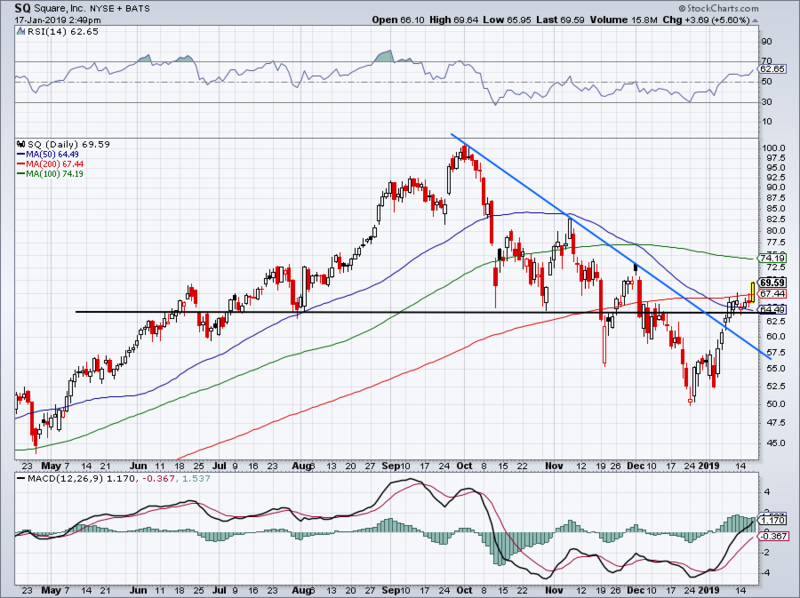 If IQ can push higher, it could cause a flurry of buying once over resistance. That may spark a move up to $22. Shares of General Electric (NYSE:GE) continue to grind higher and InvestorPlace readers have been following the levels as we go. GE stock pushed up to $9 earlier this month and was quickly rejected back down to the 50-day. From there, GE climbed back to $9 and consolidated just below that mark for more than a week. On Thursday, it broke over this level. Now I want to see a close above $9 and a continued push higher. If it can do that, the next level to watch is $10 and/or the 100-day moving average. Another high flyer on Thursday, Square (NYSE:SQ) stock jumped 4.5% on Thursday. 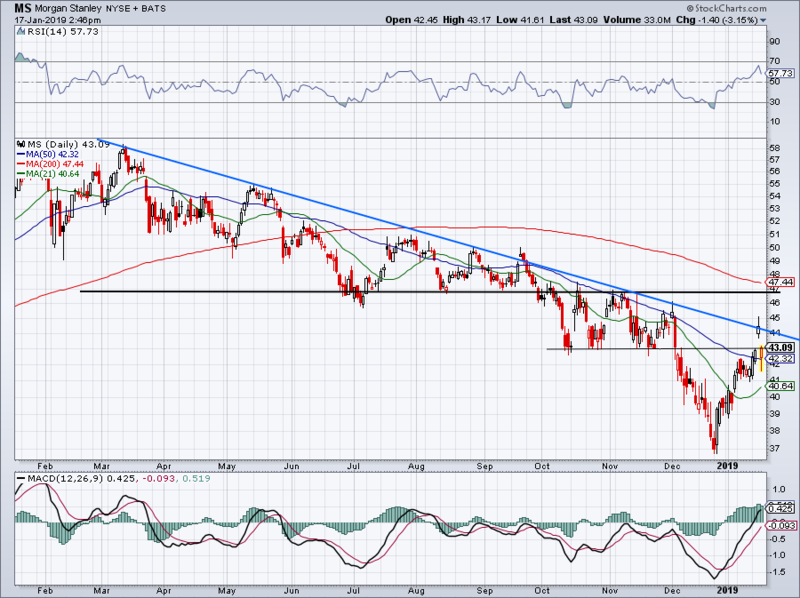 This is a continued move after SQ stock broke out over downtrend resistance (blue line) earlier this month. The stock rallied up and pushed through the 50-day moving average, but coiled just below the 100-day. The theme here? Stocks have been rallying up and consolidating for about a week before pushing through key levels again. Will it lead to a false breakout now that the major indices have recouped about half of their losses, or will they lead to further gains? We don’t know yet, which is why we outline the levels! For SQ stock, let’s see if shares can push up to the 200-day moving average. If they fizzle out beforehand, look to see that it stays over $64. Below and it may revisit the backside of prior downtrend resistance. Bret Kenwell is the manager and author of Future Blue Chips and is on Twitter @BretKenwell. As of this writing, Bret Kenwell is long GE and ROKU. Article printed from InvestorPlace Media, https://investorplace.com/2019/01/5-must-see-stock-charts-for-friday-ms-ge-sq-iq/.